Screengrab of the UK 15 Psyops Unit webpage from the Internet Archive version of the MoD website http://www.army.mod.uk/15psyops/ dated 28 July 2006 retrieved from the Internet Archive on 13 November 2009. The 15 (UK) Psychological Operations Group is a Territorial Army support Group for the British Army specialising in psyops or Psychological Operations. It is a Land unit under the administrative command of 1 Military Intelligence Bde and was set up in 1998. 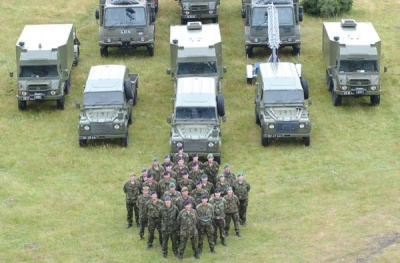 It is based in Chicksands, Bedfordshire at the Defence Intelligence and Security Centre. Responding to a question from George Foulkes the Armed Forces Minister Nicholas Soames stated in March 1997 that ‘We have one psychological operations unit, to which two personnel are assigned permanently to provide instruction in the psychological operations role. This unit can be expanded when required. These arrangements are currently under review.’  The review evidently led to the creation of the 15 POG in 1998. 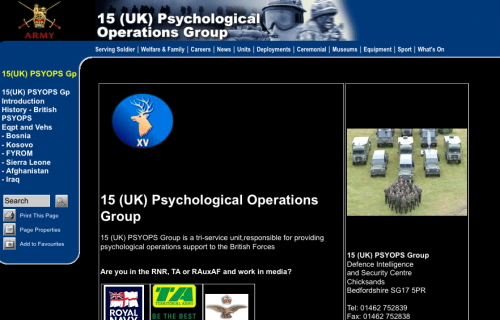 In 2004 the Mod changed then name back to 15 (UK) Psychological Operations Group. Psyops or psychological operations are an important yet hidden element of the information apparatus. On the rare occasions where their work does surface in the mainstream media, the propaganda line that they engage only in 'white' operations involving radio broadcasts and leaflet drops which are targeted only at enemy opinion (ie Iraqi forces) in order to save lives is scrupulously maintained. As Major Harry Taylor, the head of 42 Commando Royal Marines psyops unit puts it: 'The main thing is that we are trying to save these peoples lives'. In the UK psyops has been renamed 'Information support' a decidely Orwellian name change. Thousands of British soliders have passed through the psyops course run by the military and based at Chicksands, the Defence Intelligence and Security Centre in Bedfordshire. The US psyops teams in Iraq were the largest of any conflict including 11 companies and almost 1,000 personnel in Iraq or in support roles in the US, according to Lt Col Glenn Ayers commander of the 9th Psychological Operations Battalion. After the war, commanders at the US psyops HQ at Fort Bragg, were so proud of their achievements that they invited the media into their new $8.1 million centre and showed them round the facilities said to be capable of producing one million leaflets an hour. More than 150 million leaflets have been produced at Fort Bragg and distributed throughout Afghanistan and Iraq since September 2001. According to the commander of the 4th Psychological Operations Group, Col. James Treadwell the staff at the complex support the work of nearly 900 psyops troops in 13 countries. Of course no attention was drawn to the hidden part of their work which has remained largely unreported. It almost goes without saying that the content of the psyops material is mendacious. According to Major Taylor one of the messages is that the UK and US will not 'plunder the country'. Both the US and UK have run 'white' radio operations inside Iraq including 'Information Radio' broadcast by the US and Radio Nahran (Two Rivers Radio) run by the British in Basra during the war. According to some reports 'grey' operations are continuing in Iraq with one Baghdad weekly printing articles supplied by Fort Bragg, 'most of which don't appear to come from a US or military source'. In exchange the US buys and distributes 70,000 copies. The day after the fall of Baghdad UK and US psyops operatives launched their first television channel. Broadcast on the frequency formerly occupied by Iraqi TV, ‘’Towards Freedom’’ featured messages from Bush and Blair. The channel was the idea of a UK government information working group and ins commissioned by the FCO, paid for by the British Ministry of Defence and transmitted via the US 4th Psychological Operations Group (Airborne) at Fort Bragg for eventual broadcast to Iraq from Kuwait, from the US psyops plane known as Commando Solo and from SOMS-B (Special Operations Media System-B) inside Iraq. The programmes are outsourced to World Television News, the private company which already runs the UK grey propaganda operation known as British Satellite News. Still, it is clear that their activities do continue to encompass 'black' propaganda operations including radio stations which disguise their sponsors and media disinformation. But their covert work does leave some traces. For example, one 'elaborate disinformation operation' operation was conducted even before the bombs began to fall. The UK Foreign Office confirmed that it was 'investigating rumours' that the Deputy Prime Minister of Iraq, had defected. This prompted Aziz into making a live media appearance to deny the story. According to reports Aziz was then 'tracked… to a bunker at a presidential palace where they expected him to report to Saddam', leading to the 'decapitation strike' on the 20 March. As with much of the 'intelligence' surrounding Iraq this turned out to be a botched job and neither Aziz or Hussein were killed. Another example was Radio Tikrit which launched in early February. 'It appeared to be just another regime-run station. It mocked the US and… praised "Saddam Hussein's Iraq"'. By late February the tone had changed and according to BBC monitoring it started to call on the republic guard to desert their post 'before it is too late'. We use tactical and strategic methods. Tactically, on the first stage, we target the military by dropping leaflets stating the inevitability of their defeat, telling them they will not be destroyed if they play our game and exactly how they can surrender. On the second wave we show them pictures of Iraqi officers who complied. On the third wave we show them pictures of those people who did not. In other words - co-operate or we will try to kill you. This effort is a co-ordinated part of the overall propaganda push. All psyops material is 'signed off right at the very top, by General Tommy Franks' according to Taylor. And the co-ordination is also evident in the wider role which psyops has, but tries to keep under wraps. This is the fact that it also contributes to the battle for hearts and minds internationally and at home as well as targeting 'enemy' opinion. As Lt Col. Jerry Broeckert a US Marine Corps public affairs officer acknowledged, the use of the media 'blurs the line between public relations and psychological operations'. As the attack on Iraq became bogged down at the end of the first week, the Russian website with links to Russian intelligence reported an intercepted report from the US Psychological Operations Tactical Group for the Special Ground Forces Command. The report was concerned about the development of a resistance ideology' in Iraq. Its solution: 'A more active use of the Iraqi opposition was suggested for propaganda work... The same opposition members will be used to create video footage of the "repented" Iraqi POWs and footage of the local [Iraqi] population "opposing Saddam."' As the US tanks rolled into Baghdad 11 days later, footage of Iraqi's celebrating as the statue of the dictator was toppled outside the Palestine Hotel, where the international media were based was indeed transmitted around the world. Other sources have suggested that among the celebrants were members of the Iraqi opposition Iraqi National Congress. The toppling of the statue was a propaganda triumph for the US and UK governments. The involvement of psyops in the photo opportunity indicates both the co-ordinated nature of 'coalition' propaganda sand that psyops operatives spend at least some of their time managing media operations which impact on domestic opinion. In response to Iraq's invasion of Kuwait in August 1990, a coalition of national forces was assembled to provide a framework for the conduct of PSYOPS. PSYOPS activities were: Counter-Propaganda, Iraq set up several radio stations, 'Voice of Peace', also known as 'Baghdad Betty' broadcast to Arab coalition forces in Saudi Arabia, although had limited impact, as sound and content quality were poor. Leaflets, winning early air supremacy enabled extensive leaflet distribution by air, totalling 29 million leaflets dropped during the conflict and included encouragement to desert and instruction for surrender. PSYOPS and deception, leaflets were also dropped with information to aid strategic deception and led Iraq to falsely believe that there would be a marine assault east of Kuwait. Allied use of radio, A coalition PSYOPS radio station, 'Voice of the Gulf' – supplemented the leaflet campaign and broadcast messages to particular enemy formations. Loudspeakers, US troops deployed loudspeaker teams, who negotiated surrender, withdrawals of enemy formations, assisted in PW control and rounded up stragglers. It was discovered that up to 40% of all surrenders, defections and desertions could be attributed in some degree to coalition PSYOPS activity. This success, led the UK to recreate a permanent capability, which was eventually established in the form of 15 (UK) PSYOPS Group in 1998. Corporal Sarah Bryant, also a member of the Intelligence Corps killed in Afghanistan on Tuesday 17 June 2008. Staff Sergeant Sharron Elliott Intelligence Corps and 15 Psyops. Killed in Iraq in an attack on a Multi-National Forces boat patrol on the Shatt Al-Arab waterway on Sunday 12 November 2006. Lt Col Jim Suggit, Commanding Officer, circa 2008. Commander Steve Tatham - Commanding Officer 2010-2012. Dave Harper Psychology and the ‘War on Terror’ Journal of Critical Psychology, Counselling and Psychotherapy, 2004, 4, March. Retrieved from the Internet Archive of 30 April 2004. Stephen Jolly, Visiting Fellow in Psychological Warfare, ICSA Wearing the Stag's Head Badge: British Combat Propaganda Since 1945 Falling Leaf: The Journal of the Psywar Society 172 (March 2001). ↑ Jim Krane, US Units. ↑ Chris McLaughlin, 'Under Fire: Spy trick led us to Saddam' Sunday Mirror March 23, 2003 Pg. 4. ↑ <http://www.aeronautics.ru>, March 29, 2003, 0924hrs MSK (GMT +4 DST). This page was last modified on 16 April 2015, at 05:58.